Malabar Group Headquarters (M HQ) wins Special Recommendation award for Best Commercial Architecture in the Forbes India Design Award, 2019. Ar. Tony Joseph, Principal Architect, Stapati who designed the Malabar Group Headquarters received the award from Ar. Sanjay Puri, Principal Architect, Sanjay Puri Architects and Ar. Sonal Sancheti, Principal Designer, Opolis, in the presence of Mr. Subair MP, Deputy Regional Head, West Region, Malabar Gold & Diamonds in an event held at The Regal Room, Trident Nariman Point, Mumbai. 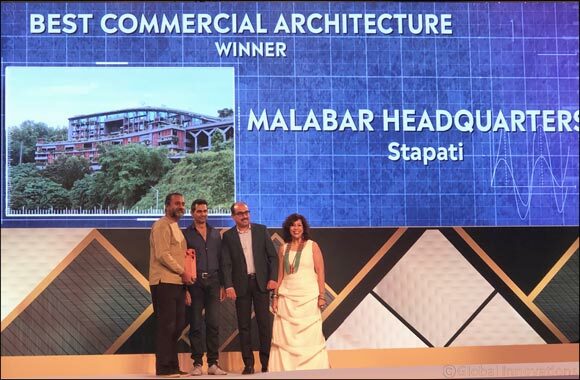 Dubai, UAE, April 14, 2019: Malabar Group, a leading business conglomerate from India with presence in 10 countries and the parent company of Malabar Gold & Diamonds has bagged the recognition of having the ‘Best Commercial Architecture’ for its Headquarters (M HQ) situated in Kerala, India. The Special Recommendation award was won at the Forbes India Design Award 2019 in the event held at Mumbai, India. Ar. Tony Jospeh, Principal Architect, Stapati who designed the Malabar Group Headquarters (M HQ) received the award from Ar. Sanjay Puri, Principal Architect, Sanjay Puri Architects and Ar. Sonal Sancheti, Principal Designer, Opolis, in the presence of Mr. Subair MP, Deputy Regional Head, West Region, Malabar Gold & Diamonds. The picturesque global headquarters of the diversified Malabar Group, at Kuttikattoor, Calicut, Kerala, India houses all its subsidiaries including its flagship brands like Malabar Gold & Diamonds, Malabar Developers, Malabar Watches, Eham Digital, etc. The Forbes India Design Awards is a national award which honors the people who shape India’s vibrant architectural and design landscape. It celebrates the best talent in the Indian design industry. Drawn from the worlds of architecture and interiors, they recognize a spectrum of architectural and interior practices in India that have evolved to match the best in the world. Covering a range of categories, the awards offer architects and designers a prestigious platform to communicate a shared vision for the future, from culturally integrated city skylines to sustainable urban communities. The Forbes India team has put together a judging panel comprising of the most extraordinary individuals that have shaped Indian architecture and design milieu. The Malabar Group Headquarters (M HQ) situated in the tropical context of Kerala is built on a unique style steep sloping site, facing the west presenting a picturesque landscape view from the building. It has been built at Montana Estates, the 150-acre serene township, situated at 800 feet above the sea-level, away from the bustle of the City. The roof is designed as a landscaped gathering space which slopes all the way down to the ground and has amphitheaters, lounges, pavilions and plenty of vegetation, serving as a space to get together and unwind. Natural vegetation comes into the interiors through spill out balconies and the central landscaped spine with dense greenery, providing opportunities for social interactions and enhances the psychological well-being of the employees. The inherent honesty in usage of materials along with the contextually relevant design helps in creating a highly sustainable building, one which is integrally connected to nature.